The keys to roadway safety are being predictable and following the rules of the road, but no matter how carefully you adhere to the law, if other roadway users don't see you and your bicycle the potential for a crash increases. 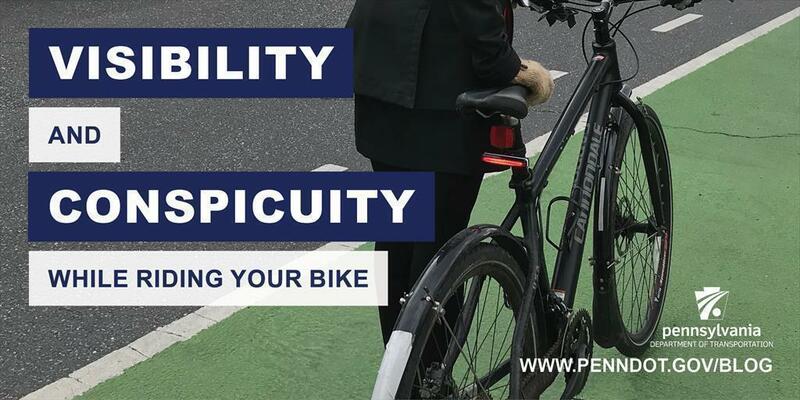 Both conspicuity and visibility matter when riding a bike. Conspicuity differs from visibility in that it includes an element of identification; if visibility is seeing something, conspicuity is seeing what something is. In 2017, almost 50 percent of fatalities involving people on bicycles occurred during non-daylight hours in Pennsylvania, according to PennDOT data (PDF). Approximately 25 percent of injuries occurred during the same time. amber reflectors on each side. Lights worn by the bicycle rider comply with law if they meet the visibility requirements. Lights are required for low light and dark riding conditions, but even in the daylight a bright light makes you more visible. Front lights should be in the range of 200-500 lumens and rear lights need to be around 20 lumens or more for conspicuity during daylight riding. Flashing lights, however, can be problematic for the 5 percent of young children and 3 percent of adult suffering from photosensitive epilepsy. Lights that flash between 3-30 times per second are the most problematic. A steady beam should be used in low light or dark conditions. One of the challenges for bicycle riders is that the reflectors on the bike are retro-reflective and thus are most effective sending directly back to the source. For many larger vehicles (SUVs or box trucks) less light will reach the driver's eyes. In addition, if the bicycle reflector is obscured or misaligned the effectiveness of the single reflector is drastically reduced. The cost-effective solution is to add more reflective surfaces to your bicycle and to your helmet with retro-reflective tape (white). This retro-reflective tape can also be added to the crank arm of the pedal or front or rear forks for additional visibility from the side. Fluorescent colors standout in contrast to their environment and improve recognition from a greater distance and appear brighter in daylight than conventional colors. These are not effective at night without natural light. Headlights and street lamps don't emit the necessary ultraviolet light spectrum. In low light conditions, reflective materials are the proper option. They shine brightly and when worn on the chest and on the ankles/knees drivers recognize a bicycle rider 94 percent of the time.